Zigzag. 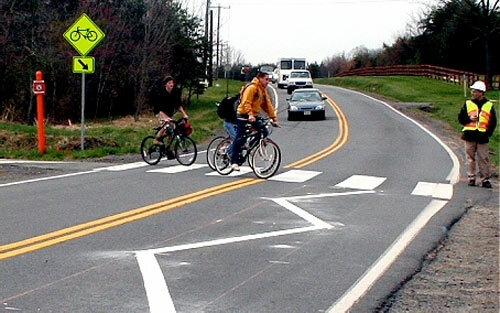 In April 2009, the Virginia Department of Transportation installed a painted zigzag stripe where a road and a bike trail intersect. Wash Cycle reports that VDOT has since studied the effects of the experimental installation and determined the lines have improved safety and reduced speeds at the trail crossing. These zigzags common overseas, but could they be coming to a street corner near you? Distracted Walking? Better watch where you walk with those headphones. ABC reports that legislators in New York and Arkansas have proposed banning pedestrians from using cell phones or wearing headphones at crosswalks under penalty of a $100 fine. Proponents claim it will increase safety, but it seems to be a classic blame-the-pedestrian response to traffic fatalities. Any chance this will one day hit the books? Starchitecture? Well, sort of. With the Academy Awards right around the corner, Curbed rounded up a collection of design from this year’s contenders including the decaying interiors in The King’s Speech to the temple-like Inception dining room to Lowell, Mass.’s blue-collar homes in The Fighter. You might also remember AN‘s recent look at movie architecture. Back in ’87. With the proliferation of shiny condo buildings across Manhattan, it’s easy to forget the grittier ghost of New York past. EV Grieve uncovered a series of photos of the East Village from the late 1980s showing boarded and burned buildings in Alphabet City. State of the Rail. After last night’s State of the Union address in Washington, D.C., Transportation Nation takes a look at continued plans to criss-cross the nation with High Speed Rail. In his Speech, the President set a goal that 80 percent of the U.S. population would have access to High Speed Rail in 2036.